Contextualising the above Quranic verse within its chapter, reveals the facts that are otherwise obscured when reading in isolation and/or citing apocryphal sources, albeit based upon medieval 'Islamic secondary sources' [uncritically accepted by the masses] without any warrant from the Quran in the first place - a method usually favoured by extremists and militants, and endorsed by Islamophobes. The believers were not permitted to fight the Arabian polytheists with whom they had a treaty. After the period of grace was over, the believers were only expected to fight those unrepentant Arabian polytheist who broke their treaty and barred or persecuted the believers in the first place. Only when the Arabian polytheists initiated hostilities and fighting were the believers expected to defend themselves – that is, to engage in armed struggle. 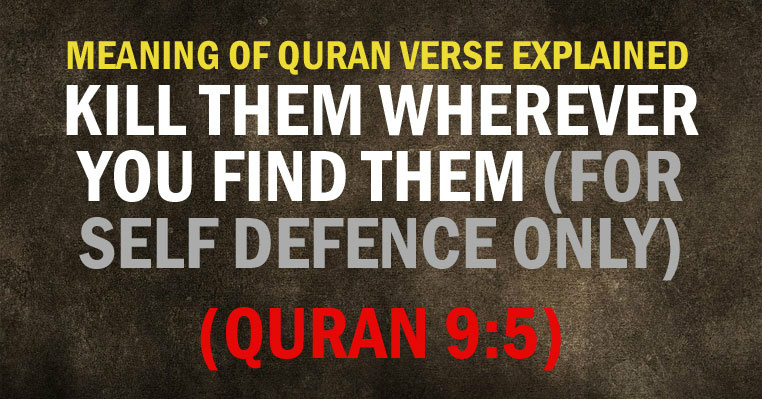 The context illustrates that the violation of the treaty and the offensive aggression by the Arabian polytheists resulted in warfare with the faithful believers [Muslims] at a particular period or in a particular situation. The Quran arguably ought to remain the most reliable source for contextual, historical and theological reference (in Islamic thought). Please see related article: War in the Quran. A release by God and His Messenger from the treaty you [believers] made with the idolaters [is announced]–– you [idolaters] may move freely about the land for four months, but you should bear in mind both that you will not escape God, and that God will disgrace those who defy [Him]. On the Day of the Great Pilgrimage [there will be] a proclamation from God and His Messenger to all people: ‘God and His Messenger are released from [treaty] obligations to the idolaters. It will be better for you [idolaters] if you repent; know that you cannot escape God if you turn away.’ [Prophet], warn those who ignore [God] that they will have a painful punishment. As for those who have honoured the treaty you made with them and who have not supported anyone against you: fulfil your agreement with them to the end of their term. God loves those who are mindful of Him. If any one of the idolaters should seek your protection [Prophet], grant it to him so that he may hear the word of God, then take him to a place safe for him, for they are people with no knowledge [of it]. How could there be a treaty with God and His Messenger for such idolaters? But as for those with whom you made a treaty at the Sacred Mosque, so long as they remain true to you, be true to them; God loves those who are mindful of Him. [How,] when, if they were to get the upper hand over you, they would not respect any tie with you, of kinship or of treaty? They please you with their tongues, but their hearts are against you and most of them are lawbreakers. They have sold God’s message for a trifling gain, and barred others from His path. How evil their actions are! Where believers are concerned, they respect no tie of kinship or treaty. They are the ones who are committing aggression. If they turn to God, keep up the prayer, and pay the prescribed alms, then they are your brothers in faith: We make the messages clear for people who are willing to learn. But if they break their oath after having made an agreement with you, if they revile your religion, then fight the leaders of disbelief- oaths mean nothing to them- so that they may stop. side note: The apparent meaning from the Quran (9:1-5) strongly suggests the four sacred months are in succession (perhaps) starting from Dhul Hijjah the first of the months of Hajj and the last being Rabi'-Awwal [as the name suggests]. It is intriguing that the word Rabi' means fourth. Due to extraneous literature and indoctrination for centuries in this regard, there may be some confusion for one who wants to followw what is intended. Nevertheless, more thorough research is needed. This does not correspond with the traditional understanding of the sacred months the confusion may have risen perhaps due to economic, religous or political motives. And God knows best.